This is what I ate for dinner (along with half of a mini pizza from Papa Johns and a diet coke). I woke up not wanting to cook (I had to take my afterwork nap, ya know…a girl can’t stay up on weeknights till 1 am without it). Breadsticks brought back good memories. The most prominent was a night that me, Kristin Hill, and Lee Retsloff went to Papa Johns in the wee hours of the morning. Murray was the type of place where you had to make the most of what there was to do. Late night on a Friday or Saturday night…if you weren’t partying at the local frat house, having a dorm gathering, or shopping at Wal-mart, there really wasn’t much else to do. 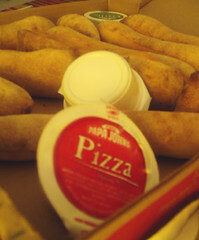 This is one of the first times I had ever had Papa John’s breadsticks and I enjoyed eating them and reminiscing. I had taken all kinds of photos today at work, but now that I have to take my memory card out to load the photos onto my computer, I must not have reinserted the card back all the way into my camera, so I end up not having any photos to show for the luncheon. Well, I guess I’ll always have the memories (as I wipe a tear from my cheek). Here is the outfit I made for the day using a flock iron-on from Plaid (a $1 deal at Michael’s). 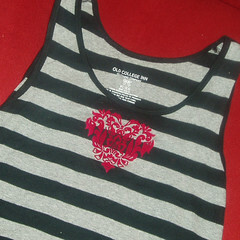 I wanted to create something sweet, but graphic and something I would want to wear not just for Valentine’s day. I think it turned out cute. Also, here’s my locket I wore today. I bought this at Third Street Stuff a few weeks ago. Since I was little, I always wanted a locket. 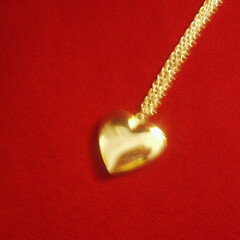 There is just something so romantic about the idea of having that little treasure so close to your heart. I have pictures of Pix and my nephews and niece in it.